Anyone remembered this when we were kids? Yes, it's the aeroplane chess. 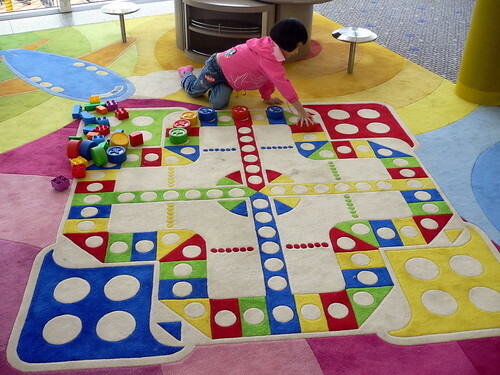 The rest of the world has a similar game called Ludo but I tell you, our Ch1nese version one is much more fun. Anyway, spotted this at the children play area at the Hong Kong Chap Lap Kok International Airport. Seeing it brought back a lot of my childhood memories. Even I got pretty excited to see such a big aeroplane chess board. Couldn't help but brought a smile to my face. wheeee.......where to buy one i wonder..hahahahahaha! Spinnee: That is going to be difficult on account of the fact that what you see in the picture isn't exactly a single piece of carpet that you can simply roll up and cart away. It is part of the airport's carpeting which I think buying the CLK airport is a tad over your budget? RedQueen: Acherly come to think of it, this game is played with a single die. Granted there are many ways to improvise, I think I was just to lazy to go through an art and craft session in the middle of an airport.